A new KBS TV program 'Road Show, The Fellowship of the Quiz' was shot at the Manhae Plaza on November 14th. Road Show, The Fellowship of the Quiz is a quiz program where university students participate and they compete to win four games in succession. The probability of success is 6.25 percent. If they are successful in the challenge, they can win one million won scholarship. "DGU has many talented students and good reputation, so we chose the DGU as the first shooting location," said a program writer. The main hosts are Jee Seok-jin and Lee hyeok-jae with Park Ji-hyun as an announcer. Participants have to contribute 1,000 won to take part in the program and that money will be used to help UNICEF. 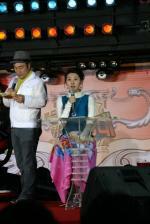 The president Oh Young-kyo also gave a donation. Participants show their special skills like dancing, singing, voice imitation or doing something funny. If they get a good score from the judges, they can take part in true-false quiz. The past judges have included Wondergirls and Wheesung. About 20 teams participated in the program and 35 students got a chance to solve quiz. It started at 1 p.m. with loud cheers and was shot during the course of six hours. Three students out of 35 received one million won scholarship. Mou Li-dan, a member of the Donggam which is a PR ambassador club, said, "I'm glad I received a scholarship. I will use it for 'Donggam'. We will open workshops to upgrade the quality of the members." The program was aired on November 23th.